As I mentioned before, after a lot of searching, I found my master copy of The Grimoire #1 and #2. 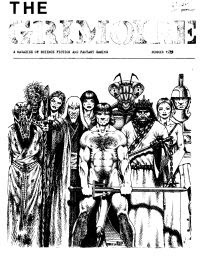 The Grimoire: A Magazine of Science Fiction and Fantasy Gaming was my attempt at a gaming fanzine in the late 1970s. I produced 3 issues with a manual typewriter and rubber cement to paste in artwork — primitive by today’s standards, but fairly normal for the 1970s. The first issue was the Spring 1978 issue. Over a year passed before the second issue came out. A number of things changed over that year. I had decided to turn my Empire of Arn campaign into a complete set of variant D&D rules and was bitten by the “complexity bug” in the process. Fortunately, I got over both, but this issue reflects what was going on at the time. This issue had much better artwork, three very nice pieces of art by Denis Loubet. These were done when he was still in college and before he started to work professionally. This issue was also full size and cost 50% less. Kinkos had arrived in San Antonio and the cost of photocopies had taken a huge drop. The Grimoire #2 also included material for the San Antonio Wargame club, a then new club that met in the basement of Jefferson Hobby Shop in downtown San Antonio. I’ll just mention SAW material in passing. The second issue of The Grimoire was 30 pages plus the cover page. The cover had a very nice illo of First Campaign Arn characters at their most powerful — just before the campaign ended. Front and center was Stonn in his infamous invisible and highly magical plate armor which had the unfortunate side effect of turning the wearer’s clothes invisible so it looked like the wearer was unarmored and naked in the dungeon. And yes, that’s a phraint and a lich in the back row. You probably do not want to know. The next two pages had the table of contents and my editorial. Ho Hum. The first article was “More Spells for Magic-Users.” Five pages of new spells from 1st to 15th level. Many were from my games, others were from some of the other campaigns running at the San Antonio Wargaming Club. Unfortunately, they were not credited in the article and I no longer remember which spells belonged to which campaign. There were about 80 new spells listed. I think my favorite is probably “One-Way Stone Wall” which worked like Wall of Stone but only existed on one side. You could cast it behind you in a corridor where it would block pursuing monsters — but the party could see through it and shoot arrows at the monsters. The next pages had more rules for Metagaming’s Melee and Wizard microgames and an article on Pregnancy in D&D. Then came a couple of articles on Chaosium’s White Bear & Red Moon boardgame: Flying Unit Rules for White Bear & Red Moon and Additional Magic Rules for White Bear & Red Moon. These were followed by The Monsters of Arn: two types of Horny Hordes and the Flickering Doom. The Horny Hordes were nuisance humanoids (and very silly) but the Flickering Doom was a fairly nasty low hit die monster than caused discord in those around it. It was based on a creature in ST:TOS episode “Day of the Dove.” Some of “The Treasures of Arn” were next. This included one of my favorite cursed items: the wand of deluded detection. It worked like the wand of detection it was supposed to be the first time a person used it, but from then on it would not detect items that were there but would falsely “detect” items that were not there. The Treasures of Arn article was followed by a picture of Cheryn, Empress of Arn with her “Sword of Ending” — the last of a set of five identical swords that were artifacts associated with the Empire of Arn. Next up was “New Independents for White Bear & Red Moon: Fanla the Witch.” This was another of my independent creations for WB&RM. Fanla was unique in that she could be played as an independent (with her power at its ebb point) or as another side played by an additional player (with her power at its peak). Fanla was followed by “Weird Techno Weapons for D&D.” These were basically magic wands in the form of guns that could only be used by Technos. Over three pages of new rules for Melee and Wizard followed, including a good number of new spells. An expanded version of the Spell Points article from the first issue was next, this time including spell point formulas for many of the early Arduin classes. Next up was a expanded for Arn version of the first issues “Divine Intervention in D&D.” It is probably useless for campaigns other than First or Second Campaign Arn. The last article before the four page SAW section at the end of the zine was a humor piece titled “From the 666th Plane of the Abyss.” It describes RPG designers as demon lords based solely on their writings about each other and other games in magazines of the time. The SAW section closed out the second issue. About 50 copies were printed. Players in my campaign and authors got free copies, the rest were sold to SAW members and at a convention in Austin. Cover price was $1.50. Like the first issue, I haven’t seen a copy since 1980 or so and I doubt many survive. I don’t have a copy other than my typed master. To get access to a download of The Grimoire #2 (as well as other special RetroRoleplaying Cancer Fund downloads), send a donation in any amount — small or large — to me via Paypal. My apologies for having to ask for donations and my heartfelt thanks to everyone who donates. If you cannot donate but wish to help, please spread the word about my request and offer. Thank you very much in advance. * Many long time readers of this site know that my wife is recovering successfully from oral cancer and that I worked on the original Microlite74 as way to cope during her recovery from 6 weeks of radiation treatment last year (2008). What I’ve never talked about is the cost. We are some of the 40 to 50 million people in the US who do not have health insurance. Worse, we do not qualify for government aid as we live in Texas and have no children. The cancer treatments have cost over $110,000 so far. While some of this has been absorbed by hospital foundations and the like, we still owe a lot of it.